Generates sharp and crisp images. Complements the capability of your printer. 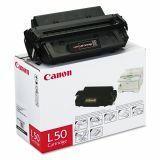 Canon L50 (L50) Toner, 5000 Page-Yield, Black - Toner cartridge is designed for use with Canon imageClass D660, D661, D680, D760, D780, D860, D861, D880, PC1060, PC1061 and PC1080F. Cartridge yields approximately 5,000 pages at 5 percent coverage.